Tag Archives for " Road Trips; "
Every now and again, there comes a must see event that you’ve always wanted to do but you can put off no longer. 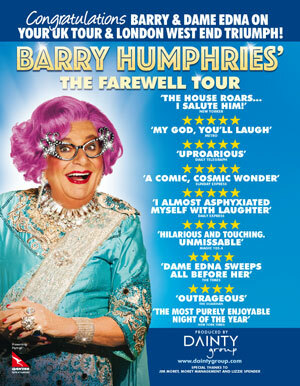 I am a big fan of Dame Edna and with Barry Humphries not getting any younger – he is 80 – this is the farewell tour. Assuming Barry doesn’t pop his clogs by then, I really want to see this. Since the tour is coming nowhere near my part of the US, I must travel. I think Mrs Caesar and I are going to be taking a mini-break around this. Washington in springtime sounds great but we will miss the Cherry Blossom festival which is on April 11. Wherever I go, let’s make sure I pack some Gladiolus instead of my Gladius. Homeland security will not be impressed with such misunderstandings.